"Very intuitive and advanced mixing suite with professional features"
Traktor Pro is one of the best products for song´s mixing out there, all thanks to the advanced technology it has been developed with. It has been created as a professional suite for DJs, which besides of bringing a complete set of cutting edge features and options, offers a very well and clearly designed interface with a different model from common two turntable interfaces. In the program, you will find 4 decks for playback featuring advanced beat detection, Sync Lock for exact mixing and automatic beat-gridding of tracks. You can organize your music library by creating your own mixes, playlists and others. In fact, it is possible to associate mixes or songs to hotkeys. Not only that, but the program offers 28 high quality effects, Auto Loops for an easier creation of synchronized loops, management in real time featuring compatibility with iTunes/iPod/Crate Flick Atwork Browsing, support for several MIDI controllers and much more. 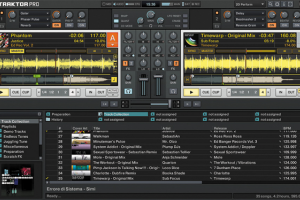 By the way, if you are just entering the world of DJs, you will be likely to use the complete documentation Traktor Pro offers in order to explain many things about the features and how they work.